1 How to prepare dahlias for storage? 2 How to store dahlias winter? 3 How to store dahlias spring? Before giving instructions on, how to store dahlias, We need to talk a little bit about the actual colors. 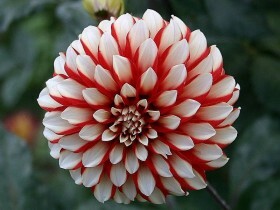 rather, their good qualities, because many gardeners simply do not pay attention on dahlia, They do not want to plant. first, on what you want to pay attention to, this is their beauty, a combination of vibrant colors and shades, different height and size of buds. second. flowering period high, until the end of autumn. third. flowers hardy. Stojko experiencing any weather, they are unpretentious to the soil, to the amount of irrigation. Dahlias good to resist disease, and the pests they are not afraid. AND, finally, roots. 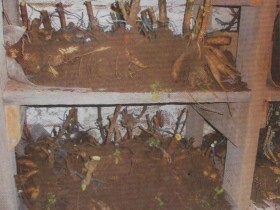 Since they tuber system, it is easier to store and care. How to prepare dahlias for storage? first, what should be done, this bust flowers. remove worthless, that is, those, are weak, with small flowers, and just ugly. They are unlikely to spend the winter. Further, shears cut stems of dahlias, leaving little, and then use a shovel gently picks up the tubers with soil. Shake and laid, to let dry. Then remove the roots and shears. Scion stem reserve, to tie the flowers of one type. How to store dahlias winter? Plant dug out, dried the. Now we send all to the basement. Specific requirements to, how to store dahlias, not. The only condition, This state of the repository. The cellar should be well prepared for the storage of vegetables. It must be clean, walls treated with lime. To monitor the humidity and temperature is also important. 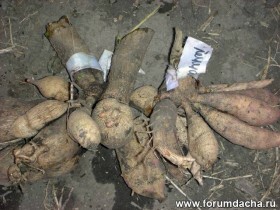 In order to increase future crop, the tubers should be cut. Cut the largest specimens, on which there is a kidney. The quality does not deteriorate. How to store dahlias spring? Flowers successfully wintered, they need to germinate. In early spring the tubers with the kidneys placed in a ground tank. Besides, it watered and loosen, worry no more about. In May, we do landing. In a shallow well, pre watering water, plant flowers. You can add fertilizer. bury, pour again. Plants planted at a distance from each other, not to restrict their freedom. Since the weather in May is unpredictable, better each sprout to cover any capacity without a bottom. If your dahlias yet, in the middle of winter, you can buy the seeds at the store and they just sprout, putting into the water until the kidney. That's all the instruction on how, how to store dahlias. agree, not so difficult. It is not necessary to give up these beautiful colors, the more so because they do not require special attention. 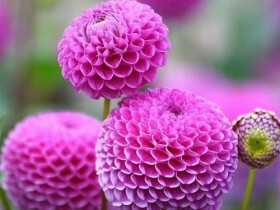 But a flower bed of dahlias, bright and colorful, will attract the eyes of neighbors.